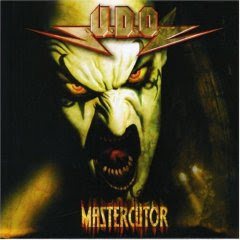 Hall of the Mountain King: Review: UDO - "Mastercutor"
I never was a big Accept fan, largely because the vocals of Udo Dirkschneider grated on my nerves. So it should go without saying that I didn’t give much thought to Udo’s solo albums at all after the first one or two. I still find Dirkschneider’s vocals one step this side of nails on a chalkboard, but I also have to admit to actually enjoy this record. It reminds me a little of Rob Halford’s Resurrection, solid, driving traditional metal that sounds more than a little like Judas Priest. Let’s just skip the silly game show intro and get right into the title track, a catchy tune that reminds me a lot of Priest’s “Night Crawler,” at least on the verse. That’s followed up with “The Wrong Side of Midnight,” featuring the same kind of head-bobbing riff as the Accept classic “Balls to the Wall,” though the choral “aiaiaiaiaiai” bits get a little old. In fact the biggest strength of this record is not Udo’s voice, it’s guitarists Stefan Kaufmann and Igor Gianola boldly riffing like it’s 1984, with a slightly better guitar sound. Though they still do maintain that slightly mechanical sound that Accept had, particularly on songs like “The Instigator.” There’s not an old school metal fan out there that can’t listen to the main riffs of “We Do – For You” (despite its lyrical challenges) or “Master of Disaster” without bobbing a head. Then there are some things that a guy like Udo should never try. Chief among those things is a ballad. Here he tries two. “One Lone Voice” is OK. It’s got a really cool chorus melody with a just slightly distorted vocal that sounds almost a little goth metal-ish to me, but the verse vocals are flat and lifeless. The other, “Tears of a Clown,” is really, really bad. As annoying as Dirkschneider’s vocals are when he’s doing his best Halford imitation, just wait until you hear him trying to be a crooner. The other thing he shouldn’t try is disco. No, there’s no outright dance track here, but the last song on the record, “Crash Bang Crash,” might as well have a mirror ball spinning as it starts. The song gets better, but it’s hard to get past the goofy opening and chorus. To be honest, those are the only two real missteps on the record, though. The other 10 tracks are about as solid as any fan of traditional metal could want. They’re crunchy, they’re catchy, and despite my personal aversion to Udo’s nasally snarls, I can’t deny the pure old school appeal of these songs. I can’t really say how Mastercutor stacks up against Udo’s catalog because I’m not familiar enough with his other work. But it’s certainly in the same league as his early work in Accept.